Bound breading, for the most part, is an old country cooking method. It also has another name—Coating l’Anglaise—which despite being a fancier moniker doesn't mean it's entirely positive. As Thomas Campbell famously wrote: “In England there are sixty different religions, and only one sauce.” So you can see he didn’t think much of English cuisine. Others still don't. a little foamy. I had to let it sit. 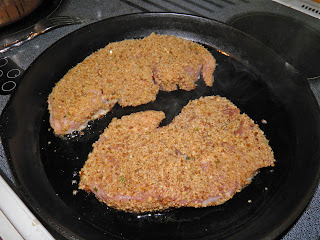 I used this bound breading on boneless pork loin chops. They’re notoriously easy to cook until dry. There’s hardly any fat at all through the meat, so anything you can do to increase your odds against that is a good thing. Essentially bound breading is accomplished by mixing together egg, milk, salt and pepper in one dish, and putting flour, bread crumbs, corn meal or rolled oats in another, the choice depending on your meat. 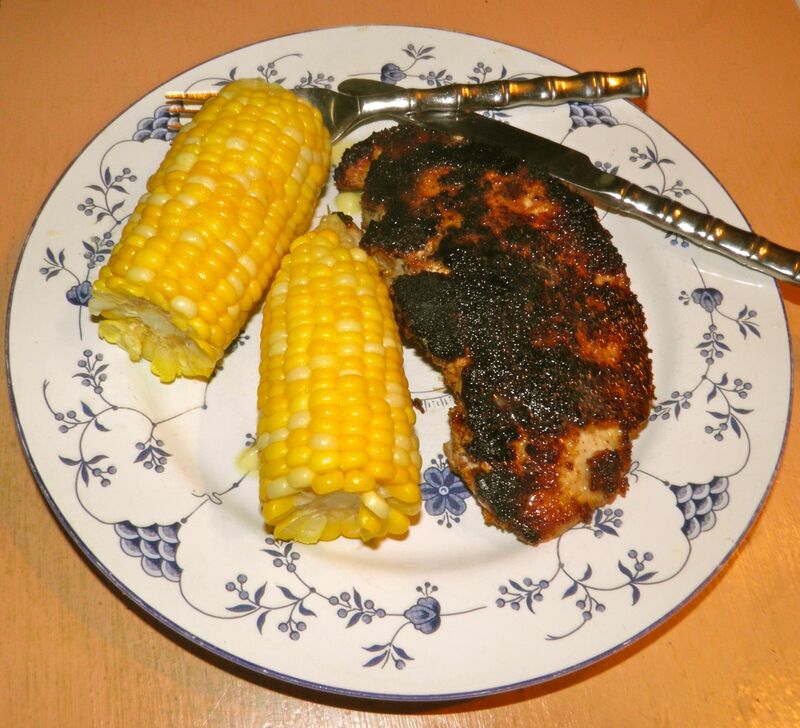 Corn meal is best for whole smelts or trout, and rolled oats are best on haddock fillets. Step 1: dip on the egg/milk to coat. There’s two secrets to making good bound breading. The first is to not make your egg/milk mixture frothy when you mix it. Frothy egg makes for uneven bread coating. The second is to pat your meat dry. This helps the egg coating adhere and thus your coating. Contrary to what others may say, you don’t need a lot of oil to fry the meat. I used about 2 tablespoons and everything turned out just fine. I have to admit a mistake I made. Well, not really a mistake… I was doing this technique from memory and I doubled the amount of egg and milk, so I had a lot of waste. 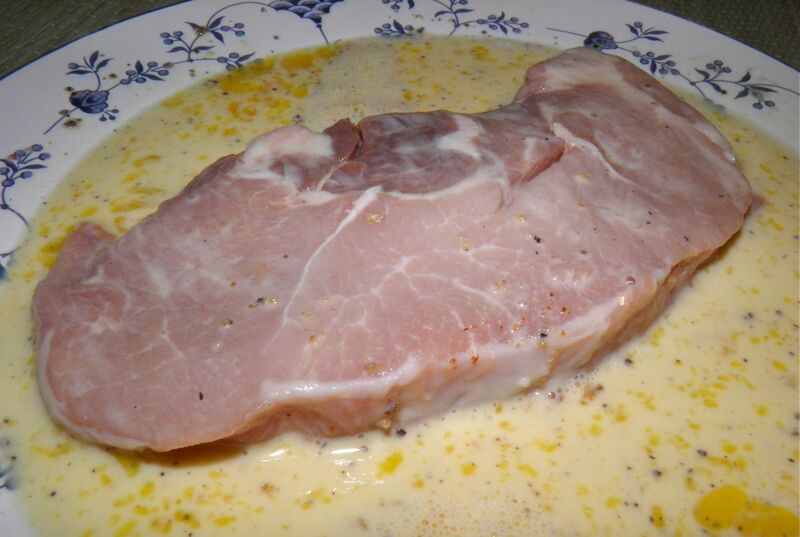 The recipe lists the right amount for 4 pork loin steaks. 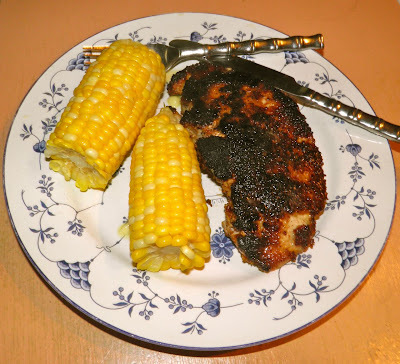 Before I go on to the recipe I want to talk briefly about corn on the cob. Most people boil it “to death.” Perfect corn on the cob only takes 5 minutes. Any more time and it becomes tough and loses some of its sweetness. Put a few inches of water in a pot (you don’t have to cover the corn) with a healthy amount of salt. Bring the water to a boil, add your corn, cover and cook. In 5 minutes you’re on the table. Sere with lots of butter, of course. 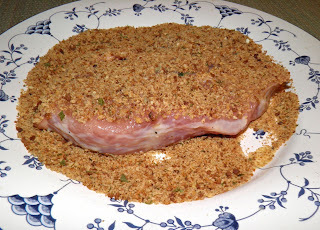 Step 2: coat with bread crumbs. Pat your meat dry with paper towel and set aside. Heat the oil in a large frying pan on medium heat. Medium heat helps you control how fast the crust browns. Crack the egg into a dinner or pie plate. Add the milk and a little salt and pepper. Gently mix until combined. Don’t be overzealous and make it foamy. Place the bread crumbs in another plate. If using plain crumbs add some salt and pepper. You can also add herbs and/or parmesan cheese. One at a time, dip the meat into the egg and coat both sides. 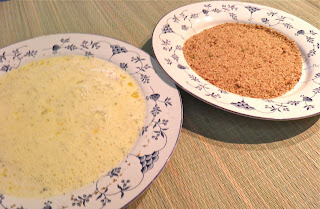 Then dip each piece into the bread crumbs. Take the coated pork and place in the hot pan. Quickly repeat with the remaining pieces of meat. Do not crowd in the pan. You may have to cook the pork in two batches. Step 3: Fry. See the useful tip in the directions. Fry the pork until well browned on one side, about 3-4 minutes. Then flip and let brown on the other side. After this time the pork will still be underdone. Take the top of a large pot and place directly on the meat. This acts as steamer and slows down the browning, but lets the meat cook through. Cook until the temperature on an instant read thermometer reads about 168°. There is no set time for this as the thickness of your pork will dictate cooking time. Pork cooks to 170° for health safety reasons. Internal temperature will creep up the extra two degrees as it sits. Bound breading plus the pot cover method reduces your chances of drying out the meat. The meat you see in the picture at top was “just done” and still very moist. Serve with corn on the cob, and other side dishes if desired.